Is it any coincidence that Peter was led to choose this verse as our church entered its 140th year? I think not! What a perfect time to pause & reflect how God's plans for one tiny part of his kingdom (our church!) have endured against, at times, great odds. Not only have we survived, but flourished! It also causes some anticipation as to what may be coming our way next - new year, new challenges, future blessings . 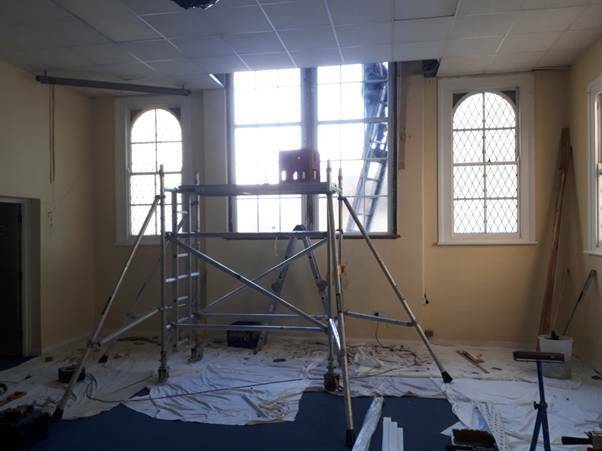 . .
Talking of blessings, our financial situation continues to be supernaturally enhanced, and so we have taken the bold move of installing double-glazing throughout the building, at no small expense, being completed (hopefully!) as I write this. For those fearing we might forever have ruined the look of the building (! ), please see the photos below for reassurance. In February we were very sad to say goodbye to Brian & Michelle Tanton & Reuben, who, after nearly a year with us, moved on to pastures new in Kent, to be nearer to Brian's ageing parents. 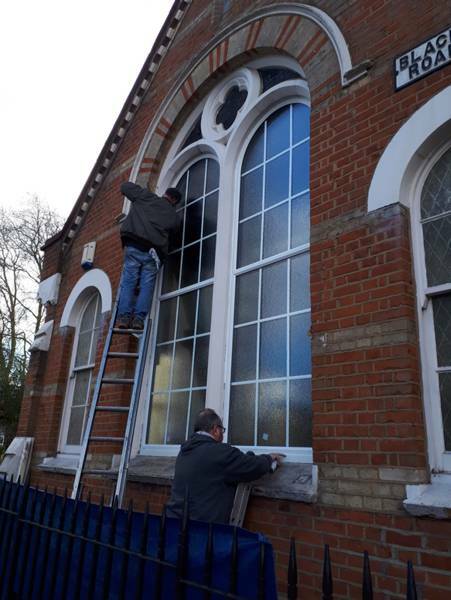 We pray God's blessing on them in this relocation, and trust they will keep in touch - not least because Daniel Tanton is remaining in the Wandsworth area, & has also become part of the 'family' at Summertown. In other news, we join in prayer to support Eugene Nylander, who, after 20 years working for the same company, was unexpectedly made redundant. May this bring new opportunities for him as he seeks God's good guidance. 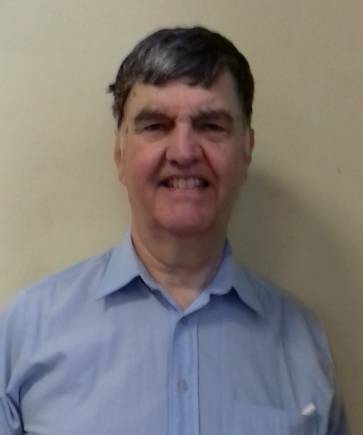 We are also praying that Charlie Stewart (Pat Griffith's cousin) will make a speedy recovery from his pelvis injury sustained in a road accident, and be able to join the regulars again soon at COM Club. We also join with Ray & Jill Werner-Parker's family & friends to pray for Ray's complete recovery from the minor stroke he suffered in February. We look forward to enjoying his preaching ministry again soon! 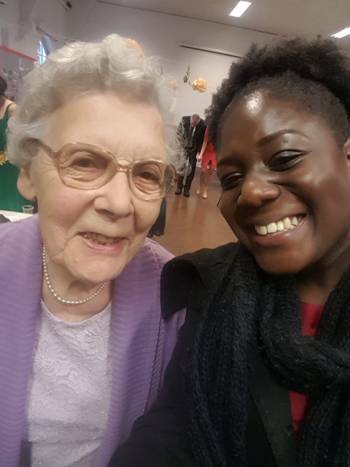 Lastly we give thanks for answered prayers concerning Julia Laine (a past member at Summerstown) as she is now making a good recovery after a life-threatening bout of food-poisoning last Christmas, though she is still in hospital. We trust God that Julia will know his complete healing. I've been involved in door-to-door evangelism for nearly 45 years now, most of that time spent working with the London City Mission, continuing it into retirement. It has been a challenging experience, at times frustrating, at other times exhilarating. This sort of work has got more difficult over the years - in two specific ways. People today, are far more apathetic towards spiritual matters than they used to be. When I first joined the LCM, virtually every time I went out on the doors I met someone I could follow up immediately; it is rare now, but it does happen! One man, working from home, invited me in the first time I met him - that on its own is a rare occurrence. We had a discussion, he took some literature, and invited me back. I've been back several times since then - it is a work in progress. People today are understandably more wary of cold-callers, and it is far more difficult to get people to talk much with me. However occasionally someone does open up and we can have a good discussion. A young man told me that he recently lost his grandfather. This had been a double blow to him, firstly the loss of a relative he was close to, then also the loss of a role, as he had been his grandfather's carer. However, despite all this, I believe that door-to-door work is still worthwhile. People generally are quite friendly towards me, and will take Christian literature, specifically the Good News Paper. The worst response I get is a short, sharp, "No, not interested", and that does not happen very often. What has kept me going in this work over all these years? There are a number of factors in this. First and foremost is the call of God. The Lord clearly called me into the LCM, and, I believe, has called me to continue this work in retirement. He promised to be with me when I first joined the LCM, and that promise, Exodus 33:14, has remained very real to me. Part of my call to the LCM was a call to persevere (Hebrews 10:35-39). The Lord has called me to get on with it, despite challenges, problems and difficulties. Then, also door-to-door work is one way to fulfil the Great Commission. Jesus calls us to go to people, where they are, with the Gospel, not to expect them to come to us. Reaching people in their homes, through door-to-door work, is one way of doing this. In door-to-door work, we can meet people from all over the world in Tooting - from those who have lived all their lives in the area, to those who have come to this country from Asia , Africa, the West Indies, and Europe, men and women of all ages. On average when I am out 'on the doors', I will meet someone at one in three of the homes I call on. In successive circuits of the area, I have met some-one at virtually all the homes I have called on. Most people are willing to talk with me, albeit briefly, and appear to appreciate my call, even if nothing, at that time appears to come from it. This is another factor in encouraging me to keep going, building on these opportunities to point people to Jesus and to pass on Christian literature, not just the Good News Paper. At the heart of what keeps me going is the need of people, the need they have of a Saviour, and that is Jesus - and how are people going to know about Jesus unless someone tells them? (Romans 10:14,15) and that is the whole point of door-to-door work. I believe that the Lord has sent me to people in their homes, to introduce them to Jesus. And finally - I need to remember that this is the Lord's Work. He has called me to sow the seed of His WORD - and to trust HIM to bring life (1 Corinthians 10:6,7). Your prayer support in this work is needed, and would be appreciated. Two days later it was 'all available help needed' to cater the Minis & Minders Christmas lunch, a very busy but lovely event, and a chance to mix & mingle a bit more with the parents and carers who come along regularly each week. The next evening it was Carol-singing around the neighbourhood, led by St. Mary's Church. The day after that, Messy Christmas took centre-stage - full-on Christmas crafts for all ages (glitter & glue! ), a nativity presentation, a carvery-style Christmas dinner, Christmas carols between courses, and then of course, pudding! Some of us had to go for a long lie-down by the end of this week - but rest was only for a day, as our first Carol Services were the day after that, and Summerstown Christmas Choir were once again asked to sing at the combined 'Carols by Candlelight' service at St. Mary's Church across the road. Attendance was encouraging, and Vicar James Fletcher made good use of the opportunity to present the Gospel, 'the real message of Christmas'. The following weekend, just before Christmas, our Sunday School ('Sunday Club') took centre-stage for our Youth Carol Service, presenting a dramatisation of The Wise Men's part in the Christmas story, which Sunday Club members had helped to write. old-er showed their favourite Christmas presents, and Peter gave a presentation 'blowing some of the myths' surrounding the Christmas story, emphasising the vital truths instead. We are absolutely delighted to welcome Jacqueline Scott into our church family, new daughter of Randy & Joanna, who was born on 16th November (weighing 7lb 7oz). Initial problems (burst pipe, so no heating, and then another spell in hospital) delayed their return home, but all is now well, and we wish them God's rich blessings for the future. Sadly (see following article), just two weeks later, our dear sister Stella Fifield succumbed to her lengthy illness, and left us to be with her Lord. The very-well attended Thanksgiving Service celebrating her long life was held on 17th December. Please pray for Stella's family & close friends as they grieve her loss. We remember Stella as a most gracious, godly lady, who was always willing to help and undertake whatever tasks needed doing. Nothing was beneath her. The words faithful and loyal come to mind as well as gracious and godly. 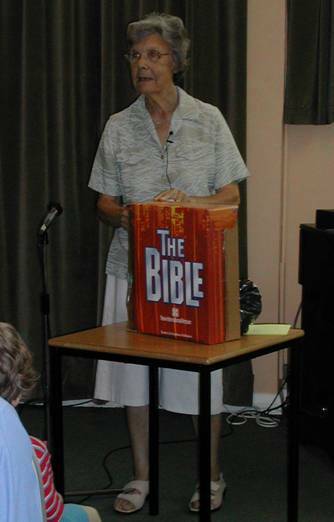 She was a wonderful teller of Bible stories and had an amazing ability to bring them to life. 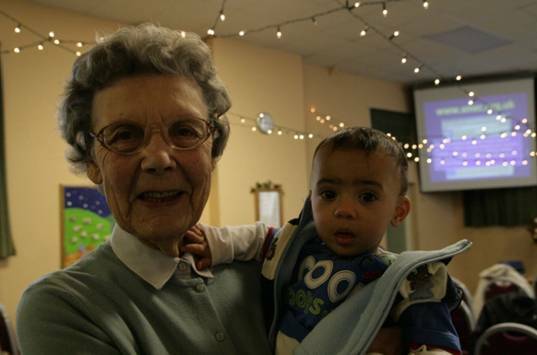 We remember a number of occasions where she shared stories with the children during services at Summerstown, and of course the adults thoroughly enjoyed them too. She spoke at the Women's Meeting at Summerstown on many occasions and was always most encouraging and interesting to listen to. Since we knew her for over 40 years, we tend to think of her and Eddie, her husband, at the same time. Elaine recalls a snowy journey to church one winter many years ago (to Merton EC where we knew Stella and Eddie before) when she was pushing our younger son in a push chair through the snow. Eddie and Stella took the older one's hands and swung him in the air as they walked along. That was typical of their helpfulness. We can also thank them both for introducing us to the Lake District, which became a favourite place of ours too. They told us of a lovely country house hotel in Ambleside where we stayed for many years until it closed. They loved walking so we also had that in common with them. My most abiding memory of Stella will always be as a faithful and constant prayer warrior. When Stella said she would pray for you or about a particular issue, you could rest assured that this would be carried out regularly and diligently. Over many years she prayed for us as a family weekly and in more recent years she lifted up the children and I before the Lord on a daily basis. She would also follow up on issues mentioned in our prayer letters, asking how things had worked out and mentioned people by name, even unfamiliar Malagasy names that were difficult to pronounce. Not long after the Lord suddenly and unexpectedly took Ravaka to be with himself, I received a lovely card and letter from Stella. The part that struck me the most was: 'I too know the heartache of losing a beloved husband.' , yet she was also sensitive to the pain I would be facing in my particular circumstances, being far from family and with two young children to comfort too. She assured me of her prayers and reminded me of the Lord's presence and faithfulness. In particular she shared a verse that had especially blessed her since being a widow, the second stanza of Psalm 27:1 with the reminder that our true strength is in the Lord and not those we tend to rely on in this life: The LORD is the strength of my life; Of whom shall I be afraid? (New King James Version). Stella will be greatly missed and her memory will continue to challenge me, and I hope others, to demonstrate that same faithfulness and perseverance in prayer for the Lord's work and for His people. Stella showed great care, kindness and generosity to us as a family. She was always interested in how our three children were doing and showed concern and thoughtfulness to us, especially around the time that I was made redundant and re-training. We are so grateful for her prayers for us. Stella showed amazing faithfulness in coming to Minis and Minders week by week to make the teas and coffees, even when she was tired. She always arrived early enough for a time of prayer before the meeting. The parents and carers really appreciated her. "You are the family of God you are the promise divine..."
Stella and her husband Eddie had a Christmas tradition which she carried on long after his death. Instead of giving Christmas cards, she listed the names of everyone in church and tick each one as she wished us Merry Christmas. The money that would have been used for cards would then be given to a Christian charity. A wonderful gesture! My favourite memories of Stella are spending time with her in church. She always sat in the same seat in the right hand side by the window where she loved to praise God. I remember her exuberantly singing "Teach me to Dance" by Graham Kendrick whilst clapping her hands to praise God. I loved her freedom of worship. I also remember her adding a wholesome "hallelujah!" after an especially good sermon Peter had preached. I especially remember the amazing stories she used to tell during Family Focus. This amazing woman wrote to me every single week for months and months to encourage me when I really needed it. It meant the world to me and I now treasure these letters. I love and miss Stella!! But she's with Jesus now - and I know she's happier than ever. Stella was a lady who really loved the Lord! I got to know her through the weekly Women's Meeting at Summerstown, where I learned so much from her. I got a lot more confident in sharing my faith and leading others in learning from the Bible, from Stella's encouragement and example. Stella was always so generous, inviting us to her home, and showing love to everyone - a godly lady who loved to serve her Lord!